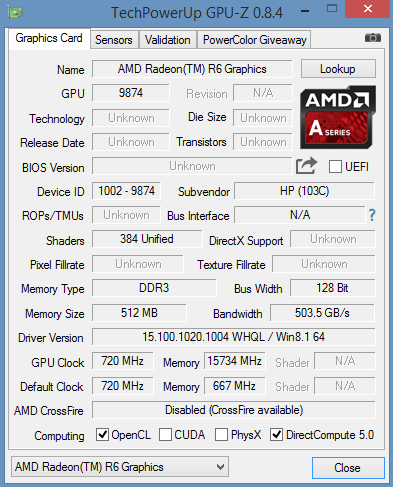 Carrizo in Review: How does AMD's A10-8700P Perform? Kaveri done right. 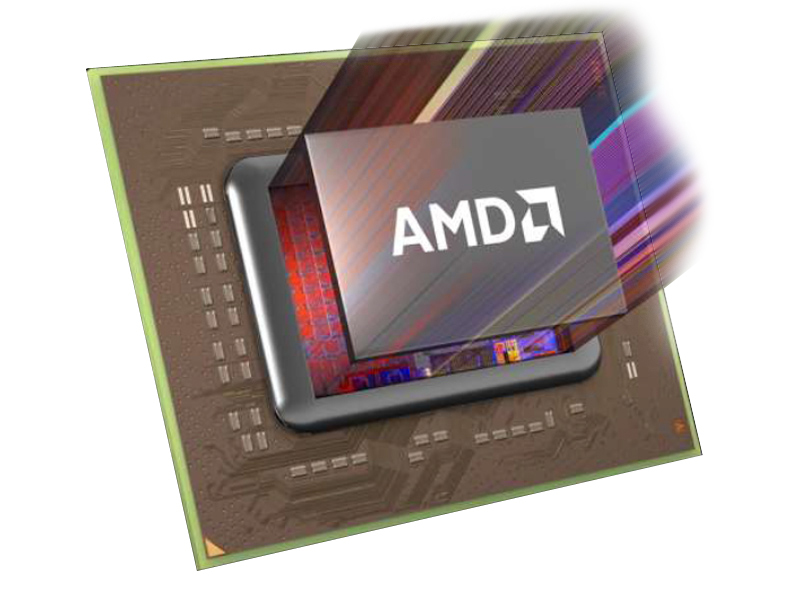 Faster, more frugal, and versatile – AMD's Carrizo APU is supposed to deliver what we already expected from the predecessor. 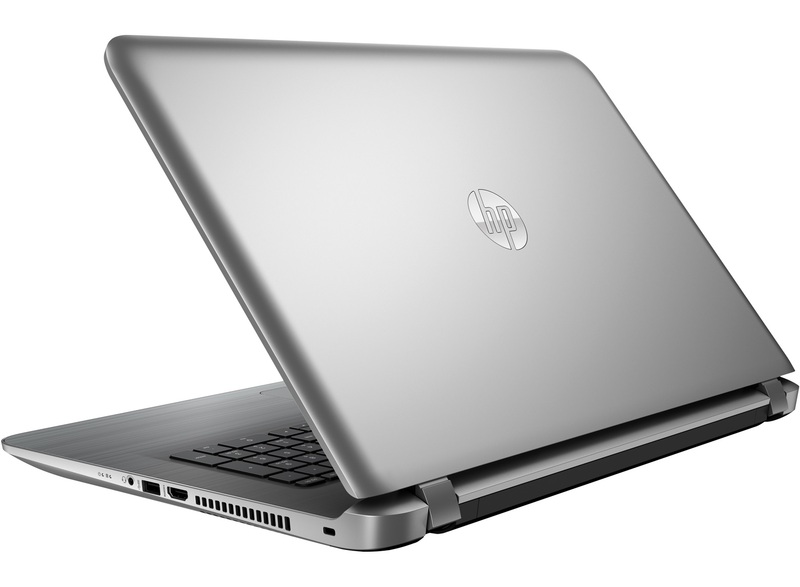 We evaluate whether the new generation can compete against Intel's Broadwell architecture. 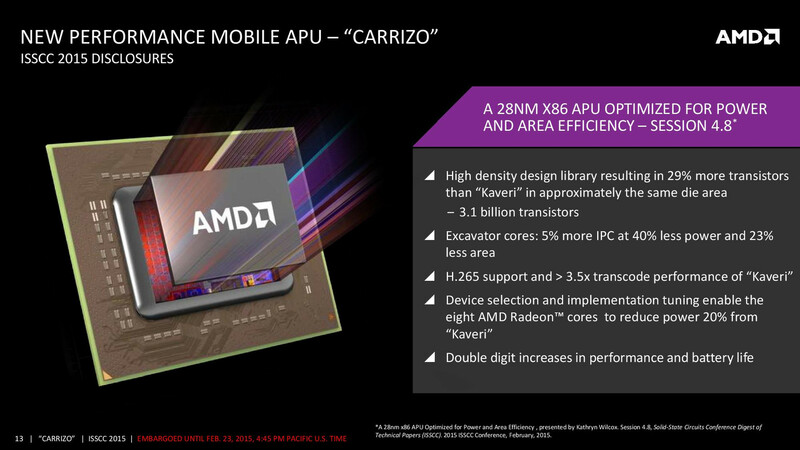 Almost two months after the official announcement of the AMD "Carrizo" APU, the first models are now available – time to check the performance and efficiency promises of the manufacturer. After a short overview about the architecture, model lineup and review unit, we want to have a closer look at the processor and graphics performance as well as the multimedia abilities of the chip. After we had a detailed look at the new Carrizo architecture in the last weeks and months, we just want to give you a short summary at this point. Carrizo is the successor of the previous Kaveri architecture, but it is still manufactured in the same 28 nanometers SHP process at Globalfoundries. Thanks to the special High-Density-Libraries, AMD was still able to increase the pack density by 29 percent – at almost the same die size of 245 mm², the APU now has 3.1 billion transistors instead of 2.4. 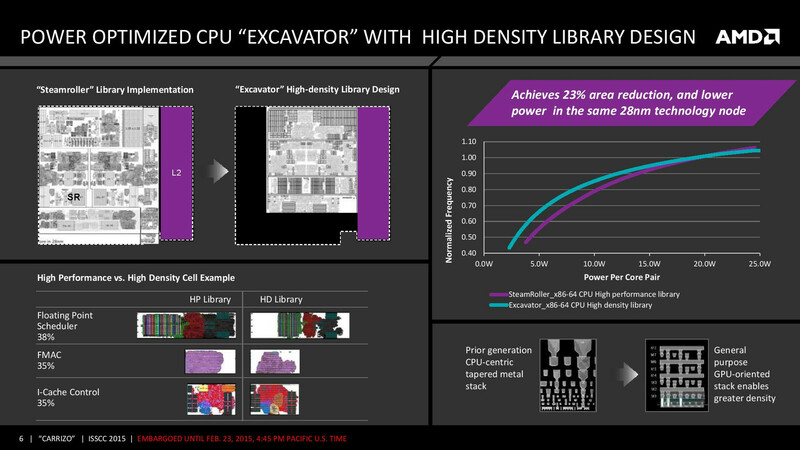 The CPU cores can benefit from that, the new "Excavator" design is supposed to offer a roughly 5 percent higher per-MHz performance than before. Other measures like Voltage Adaptive Operation and AVFS (Adaptive Voltage and Frequency Scaling) are supposed to adjust the supply voltage as precisely as possible to each situation and therefore improve the efficiency. 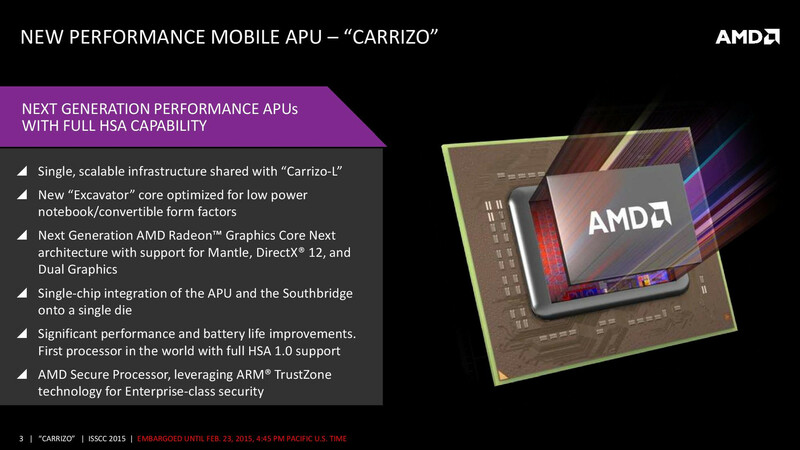 AMD is particularly proud of two special features, which are even slightly ahead of Intel’s current Broadwell architecture: For starters, Carrizo is a "real" SoC, where the Southbridge with all I/O ports is directly integrated into the chip. The manufacturer also promises a very modern video unit with H.265/HEVC support, whereas Broadwell only has a generally less efficient hybrid decoder. We want to use this review to find out if AMD’s solution can also convince in practice. Contrary to Intel’s widespread Broadwell lineup, the Carrizo lineup is pretty simple: Only three models – the FX-8800P, A10-8700P and A8-8600P – were presented by AMD for the launch. We think there are two reasons for that: First, the manufacturer had to ensure that Carrizo is not cannibalized by the fastest chip from the cheaper Carrizo-L-series. 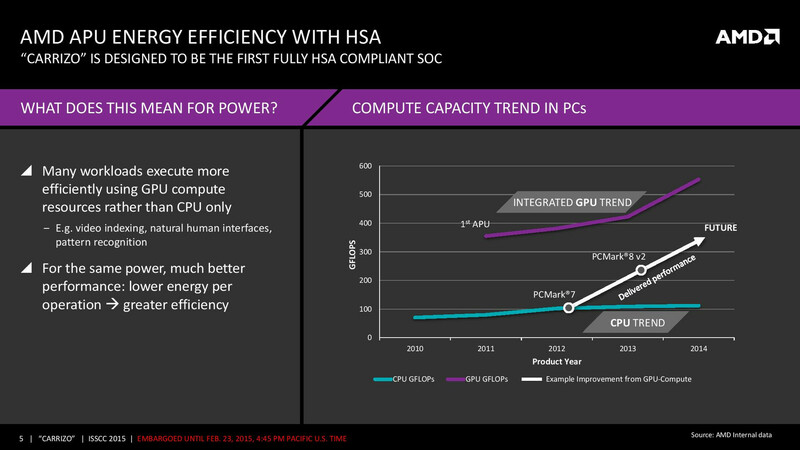 This also means that there will not be heavily reduced APUs with less than 4 cores or 384 shader units any time soon. The configurable TDP between 12 and 35 watts also allows the manufacturers to adjust the performance and consumption to each device – separate models for every TDP class are not necessary. 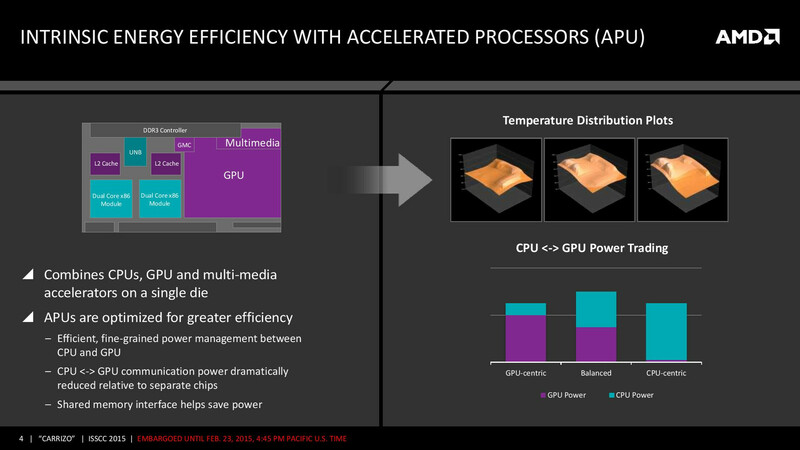 Note that this also means that two notebooks with the same APU can deliver completely different performance results. A positive aspect is the standard use of two memory modules. AMD notebooks unfortunately suffered a lot from unfavorable memory configurations in the past, so the good raw GPU performance did not result in correspondingly high frame rates. 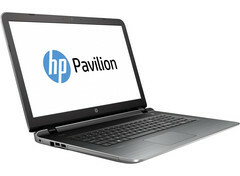 The matte Full HD panel and the additional dedicated graphics card are pretty rare in this price range as well. 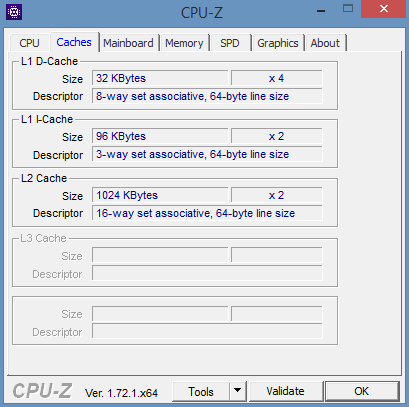 However, we want to focus on the Carrizo APU in this article, so we enforced the use of the processor graphics for all applications in the Catalyst Control Center. 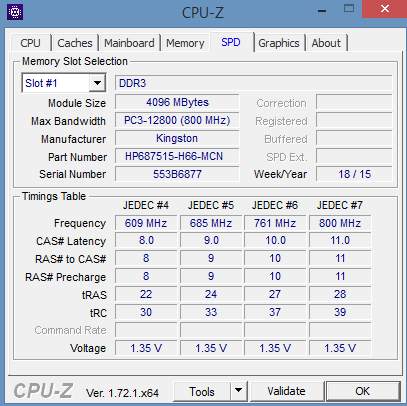 Note: Even though the spec sheet from the manufacturer and the memory SDP indicate DDR3L-1600 modules from Kingston, our tools (CPU-Z, HWInfo) showed an actual memory clock of just 666 MHz (DDR3-1333). If this is not a read error, the following GPU benchmarks could be affected by around 5 up to 10 percent. We already mentioned that the TDP of the new Carrizo models can vary between 12 and 35 watts – it is unfortunately not known which setting HP chose for the Pavilion 17. The same chassis is also available with Intel ULV processors as well as inexpensive Beema APUs, so we expect a similar consumption of around 15 watts. This evaluation also corresponds with the consumption values later in this review. 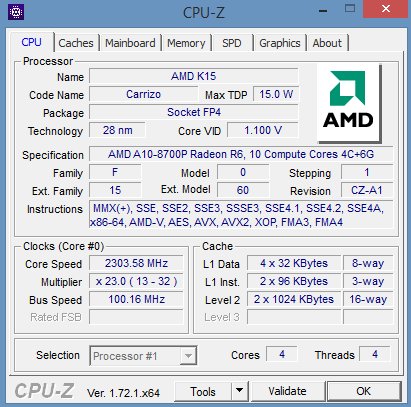 If you consider the TDP of the two Kaveri-based predecessors FX-7600P (35 watts) and FX-7500 (19 watts) did not even have an integrated chipset, AMD really did a great job with Carrizo: On average, the A10-8700P beats the old FX-7500 by almost 20 percent, which is mainly a result of the Turbo, which works properly now. 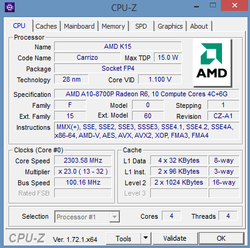 The APU runs at 3.1 GHz in the majority of single thread applications, only 100 MHz below the specified maximum clock (1.8-3.2 GHz). 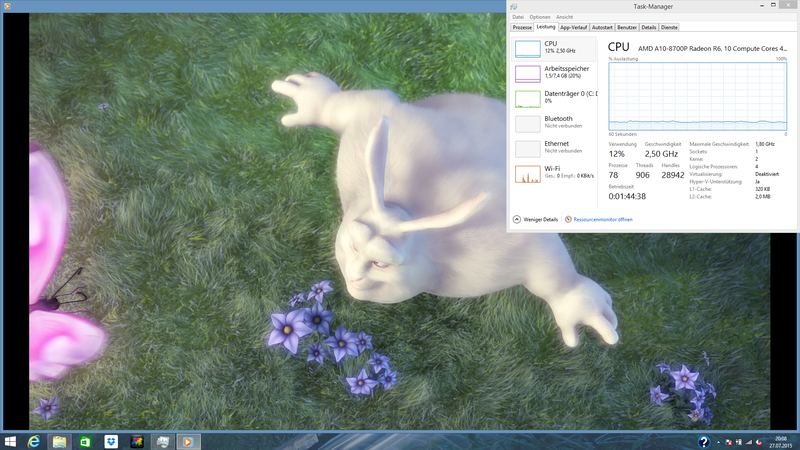 The clock is reduced to 2.3 GHz when you stress all four cores, but this is still higher than the nominal clock. In combination with the slightly increased per-MHz performance, the chip is fast enough to compete with a Core i3-5005U or i3-5010U. 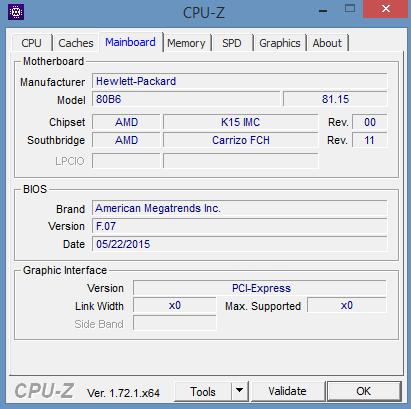 Carrizo cannot keep up with the faster Broadwell chips however – even the slightly higher clocked FX-8800P should (at a similar TDP configuration) lag behind a Core i5-5200U. Still, the advantage in respect of the single thread performance is remarkable. Many processors, especially the ULV models, can increase their TDP for a short while to compensate individual peak load and provide a smoother user experience. The usual benchmarks, however, lose their significance because of that – what is the benefit of a high Cinebench score if the performance in a big rendering project will drop after a few minutes? 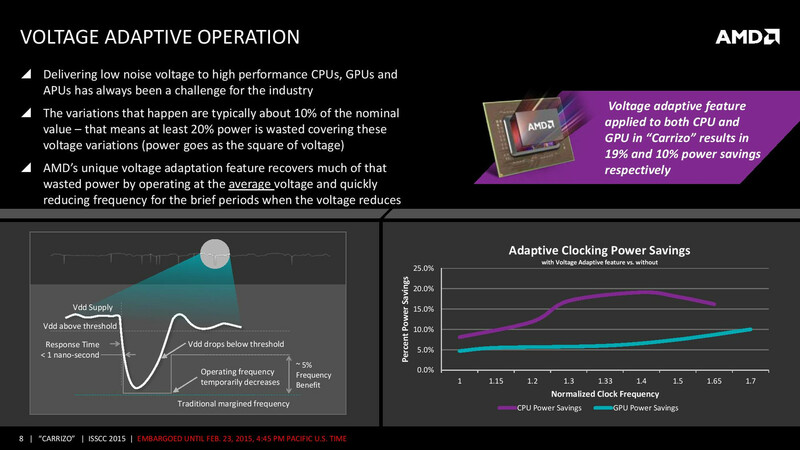 We therefore also investigated the clocks and the performance under sustained CPU load. You can see that the clocks at the beginning can be maintained pretty well over longer periods: Only 100 or 200 MHz lower clocks in the single and multithread test of Cinebench R15 should be hardly noticeable in practice. 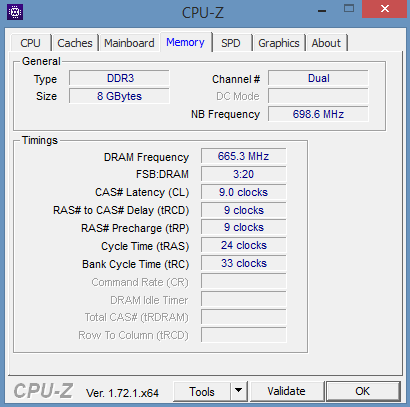 The clock only drops significantly in the extremely demanding stress tool Prime95, but this is not really important. All three scenarios show a power consumption of around 30 watts for the whole system, and are therefore on par with comparable Intel ULV notebooks. 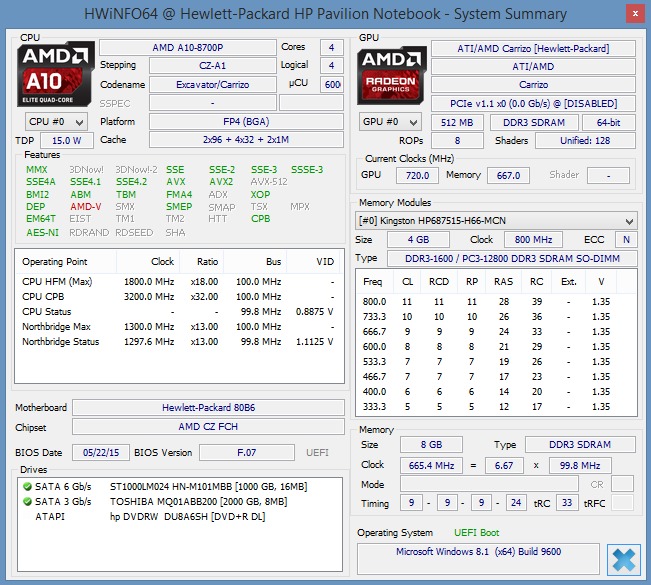 This confirms our suspicion that HP limited the TDP of the A10-8700P in the Pavilion 17 to 15 watts. While the difference in the CPU clocks between the FX-8800P and A10-8700P is limited to a couple of hundred MHz, AMD clearly reduced the GPU performance of the smaller model: Our A10 only uses 386 shader units (= 6 Compute Units) from the original 512 units of the Carrizo chip, only the FX model can use all 512 ALUs (= 8 Compute Units). Thanks to much higher GPU clocks of up to 800 MHz (manufacturer’s information, it seems that the review unit only runs at 720 MHz), the A10-8700 can still easily beat its predecessors FX-7500 (384 shaders, up to 533 MHz) and A10-7300 (384 shaders, 533 MHz). All in all, Carrizo manages an advantage of around 15 percent; if the memory of the Pavilion is really only clocked at 667 MHz (DDR3-1333), the real difference should be higher than 20 percent. The duel with the HD Graphics 5500 (Broadwell) is usually won by Carrizo if the game is heavily limited by the GPU. AMD’s solution is a couple of percent ahead in Tomb Raider or Evolve, whereas Dota 2 or The Sims 4 show pretty much the opposite results. We can say the same thing for both GPUs: More than minimum details are not possible in current titles – but you can expect at least medium settings and 1366x768 pixels if you only play classics like Counter-Strike: GO or Diablo III. By the way, the Radeon R6 does lose less performance compared to the HD 5500 at higher resolutions, because the limitations by the CPUs are reduced. The performance of the A10-8700P should be even higher with faster memory, and – similar to the predecessor – it is possible to use the processor graphics in combination with a dedicated GPU in a dual-graphics configuration. We will have a detailed look at this in combination with Windows 10 in a separate article. Update from 07/31: More gaming benchmarks added. The TDP usually limits ULV chips when you stress the processor and integrated graphics unit simultaneously, so there is a noticeable performance drop after a little while (after around 30 seconds for current Intel processors). We use two (static) gaming scenes to see if Carrizo is affected as well. The frame rate in our Dota 2 scene fluctuates at around 24 fps (42.5 watts total consumption) directly after the start, until it drops to 21 fps (31.6 watts) after two minutes. We can see the reason when we look at the clocks: The A10-8700P starts at 1.8 GHz (CPU) and 530 MHz (GPU), respectively, before the values drop to 1.3 GHz (CPU) and 380 MHz (GPU). Contrary to Dota 2, Diablo III reduces the processor performance in favor of the GPU, which is why the APU starts at 1.3 GHz for the CPU, but 600 MHz for the GPU (41.8 watts). We can once again see a drop from 47 to 39 fps due to the TDP after around 2 minutes, but this time only the GPU is affected and runs at 430 MHz (31.8 watts). Overall, we can say that the performance is steady under sustained 3D load. 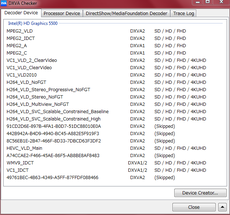 We cannot determine significant drops that we know from some Core-M devices (due to the extremely low TDP). Carrizo is the first x86 processor or first x86 APU, respectively, with an integrated video unit that can also decode the current H.265/HEVC codec with specialized Fixed-Function hardware – Intel’s Broadwell chip on the other hand uses a generally less efficient hybrid approach, where a part of the calculations are executed by GPU shaders. 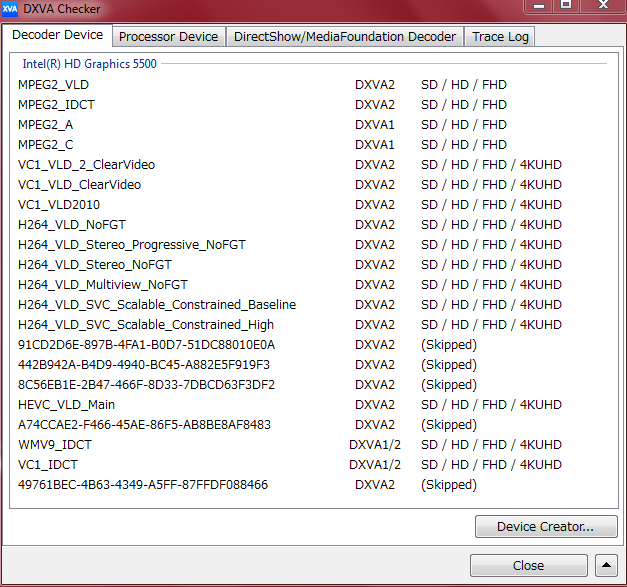 HEVC in combination with 10-bit color channels are unfortunately supported neither by Carrizo nor by Broadwell. 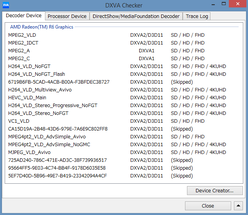 Only Nvidia’s GM206 chip (available on the desktop GPU GeForce GTX 960) is already prepared for that. 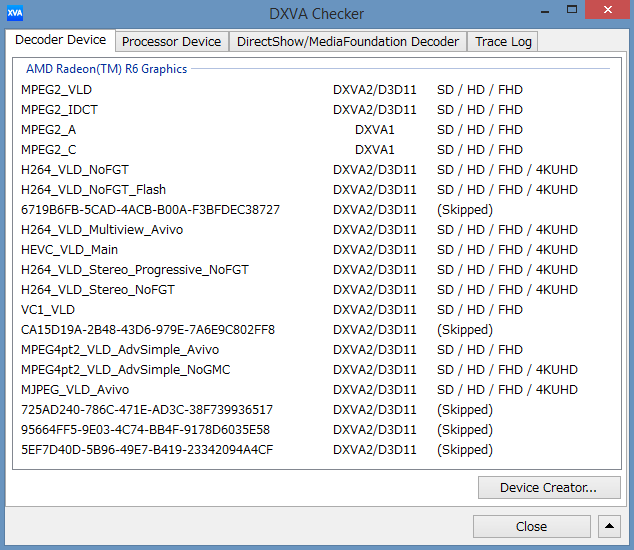 H.264 decoding should not be a real challenge for any processor in 2015 – and it isn’t for Carrizo: There are no problems and the CPU load is not very high even with our very demanding sample video in the 4K resolution, 60 fps and almost 100 Mbps. 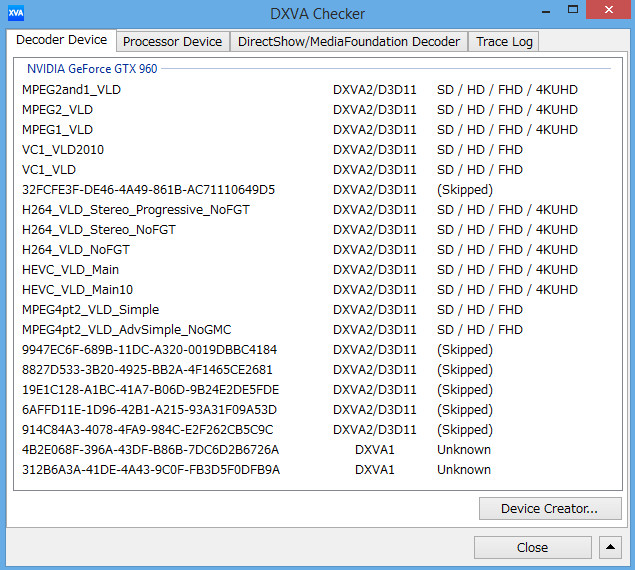 Our first attempts to test Carrizo’s HEVC decoder in Windows 8.1 via DXVA2 (native) and the Media Player Classic failed – contrary to Broadwell or GM206, our Carrizo system still decoded all the videos in software. 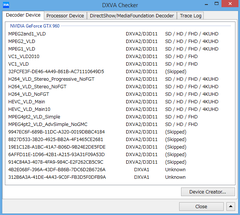 This problem was only solved after we followed a tip from AMD and used the full version of PowerDVD 15 (we want to thank CyberLink at this point for the provided test version). 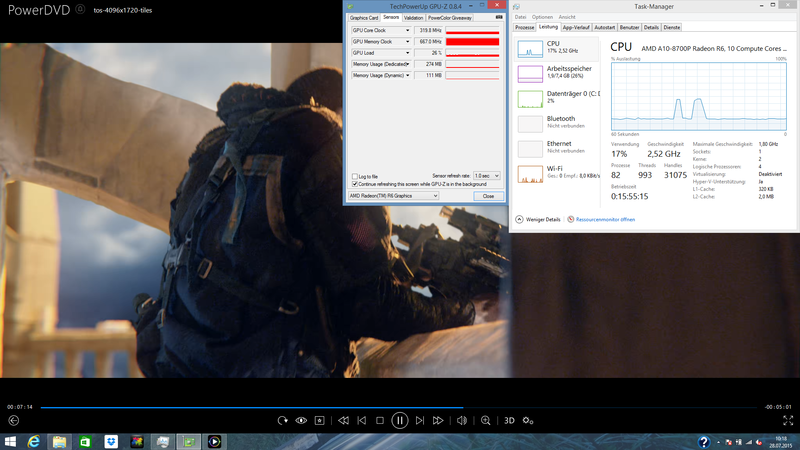 The power consumption of the Carrizo system is noticeably increased during H.265 playback, despite the dedicated Fixed-Function units: The additional consumption compared to an idling Windows Desktop is around 10 watts in our first sample video (Tears of Steel 4K, 2.6 Mbps, 24 fps); exactly the same as a Core i5-5200U that we used for the comparison. Interesting: The Intel system even needed 2 watts more when we used the hybrid decoder – it seems that software decoding on the Broadwell CPU cores is more efficient than the use of the GPU. 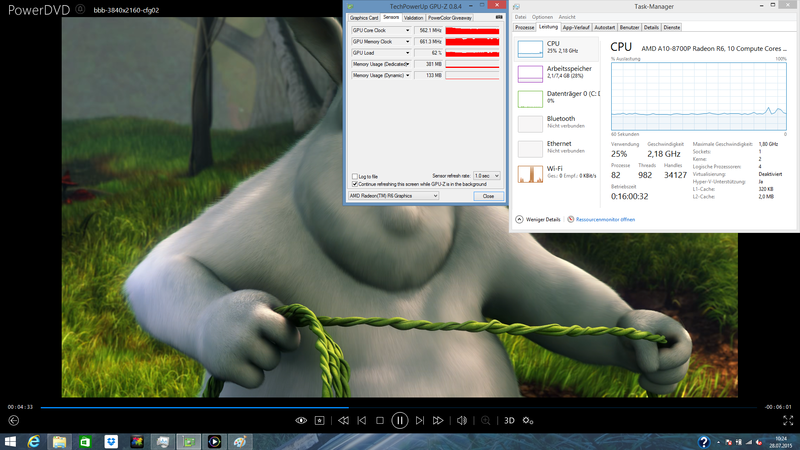 The Core i5-5200U was not able to provide smooth playback of our second sample video (Big Buck Bunny 4K, 6.1 Mbps, 60 fps) independent of the player and decoding method. 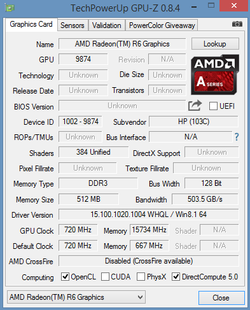 Carrizo has issues as well (GPU load of up to 70 percent), but can at least provide smooth playback – advantage for AMD. The power consumption of the overall system (around 31 watts), however, is around 20 watts higher than the idle value and reaches levels similar to 3D games or demanding CPU benchmarks. Finally another word about Windows 10: Microsoft’s latest operating system is already prepared for HEVC/H.265 and should be able to play correspondingly decoded videos without additional software. We will compare the differences to Windows 8.1 and PowerDVD in terms of consumption and hardware utilization in another review. It is unfortunately hardly possible to evaluate the efficiency of a platform based on the power consumption of just one system – the influences by other components as well as the energy settings from the manufacturer are too big. Still: A minimum idle consumption of just 4.1 watts for a 17-inch notebook with Full HD display can actually be called frugal. We already mentioned the load consumption a few times over the course of this review; it is roughly on par with the Broadwell-based competition with 15-watt CPUs. In numbers: Directly after the start of 3DMark 06 (38 watts) or our stress test (39.6 watts), our measurement device shows almost 40 watts, which is reduced to slightly more than 30 watts when the TDP limitation sets in after around 2 minutes. 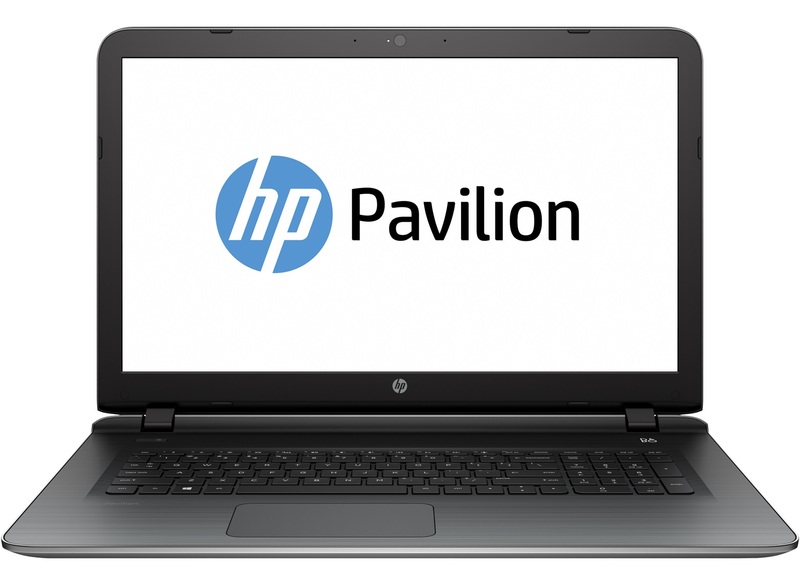 Limited by its somewhat small 41-Wh battery, the Pavilion 17 should only last around 3.5 hours based on our estimations, which is meager. We will provide further measurements in the usual scope in an upcoming review. Is Carrizo a success against Intel's overwhelming market share? 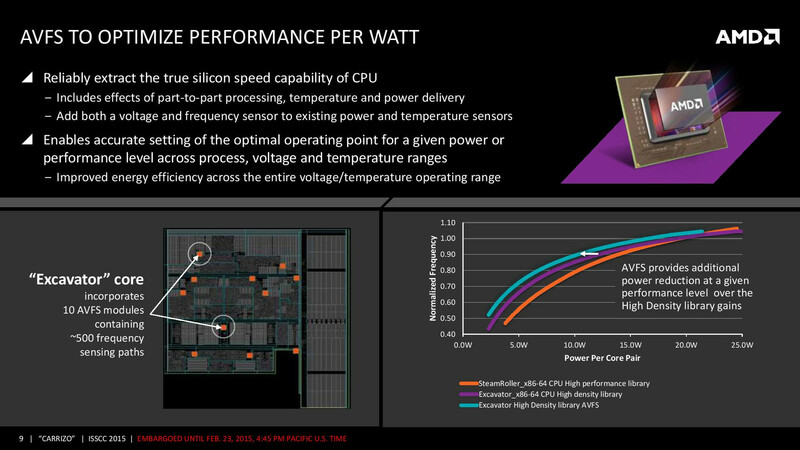 One thing is certain: AMD’s latest APU generation is the biggest leap in terms of power efficiency in the last couple of years. 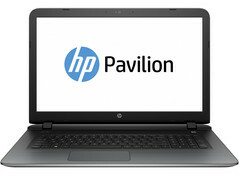 The manufacturer now once again provides the most powerful graphics solution within the 15-watt segment, even though the reviewed Pavilion 17 is probably slightly slowed down by the not perfectly configured memory. 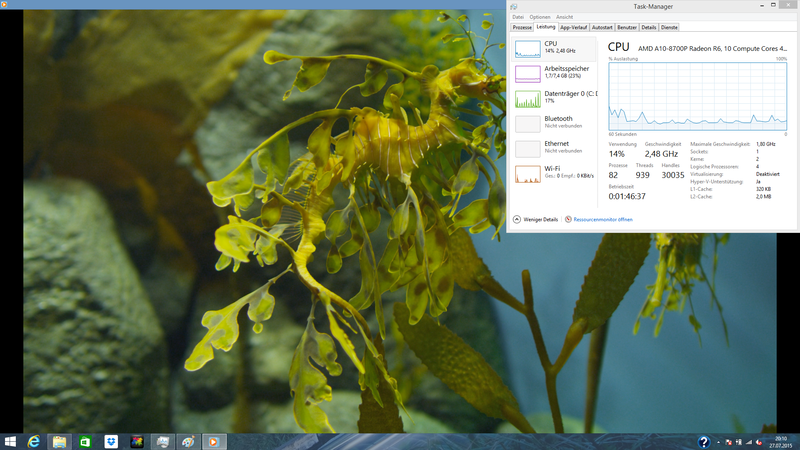 The CPU part also performs well and at least does not have to fear the current Core i3 chips. It is not enough to compete with the Core i5 models or higher, but they also have a much higher price. We really want to praise the modern H.265 decoder, which – even though not as frugal as hoped – even provides smooth playback of demanding 4K videos. It remains to be seen how the notebook manufacturers can utilize the potential. HP’s Pavilion 17 shows good approaches like the Full HD display and the standard dual-channel memory configuration, but details like the obviously faulty BIOS (e.g. memory clock) still affect the overall impression a bit right now. We would also like to see more devices without an additional dedicated GPU, but in return with fast DDR3-1866 or DDR3-2133 modules. This should provide remarkable performance in combination with a generous TDP limit, especially for the top model FX-8800P. 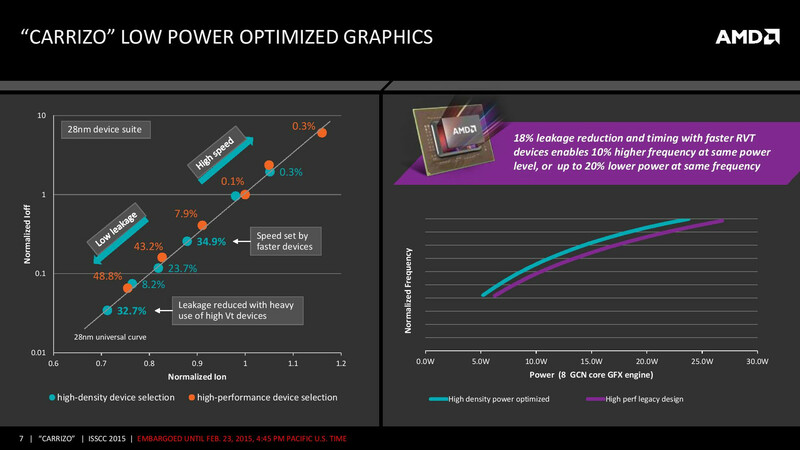 > Notebook / Laptop Reviews and News > Reviews > Archive of our own reviews > Carrizo in Review: How does AMD's A10-8700P Perform?